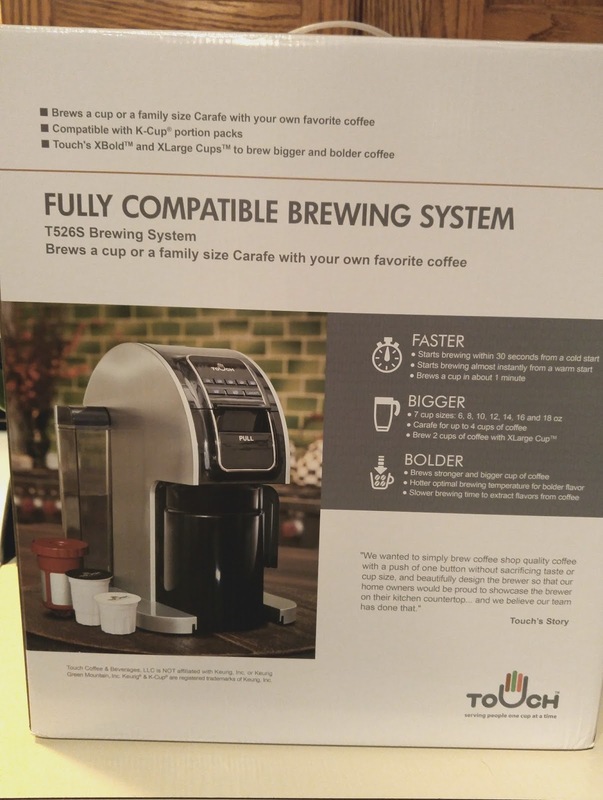 The brand new Touch T526S single-serve system (retail value $249.99) features the latest brewing technology for coffeehouse quality coffee you can drink together at home. This is the perfect way to heat up Valentine's Day with a quality cup of coffee! While single-serve coffee systems continue to gain popularity, there have always been drawbacks: weak coffee, the ability to brew only a small cup at a time, and most notably, flawed coffee capsule designs and water heating systems. Touch Coffee & Beverages is re-inventing the single-serve coffee platform with the release of its ground-breaking Touch® T526S brewer and re-engineered capsules. Not only do Touch's easy-to-use systems brew superior-tasting, coffee shop-quality coffee in significantly less time than current machines, but they are also open platform. This means that the brewers are fully compatible with any cup at all—from existing Keurig K-Cups® to generic cups, in addition to Touch's ground-breaking XBold Cups™, XLarge Cups™ and reusable Refill Jumbo Cup™. ­According to the National Coffee Association USA, the brewing water temperature for a good cup of coffee is "between 195-205 degrees Fahrenheit for optimal extraction." The Touch® T526S brewer reaches this ideal temperature by using its Flash Heating system and starts brewing in under 20 seconds after being off all night. 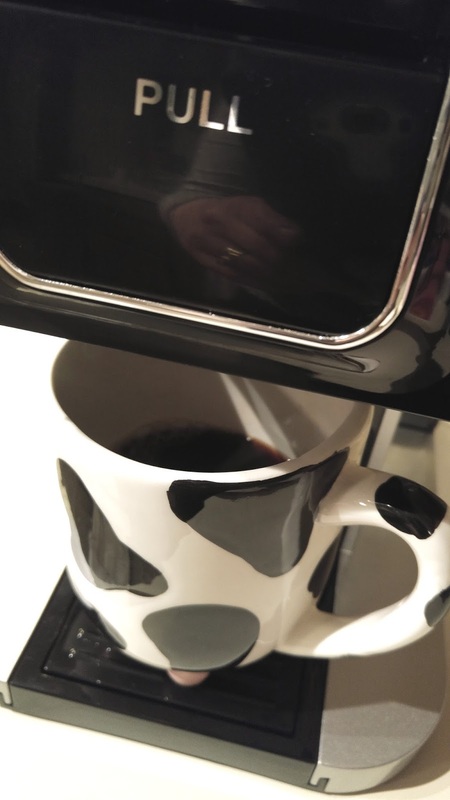 Plus, Touch heats just enough water for the selected cup size as opposed to the entire tank of water, and the machine turns itself off after using, making it more energy efficient than its competitors. Touch's superior coffee quality is also due to the fact that the hot water has more contact with the coffee grounds, which ensures that all of the coffee flavor is extracted. Other machines take much longer to warm up and then shoot water through the coffee grounds too quickly, so you end up throwing away untapped flavor with the used capsule. Even with a slower, more deliberate brew, when factoring in the warm-up time, the Touch® T526S still turns out a cup of joe in a fraction of the time. Compared to most K-Cups®, which only fit up to 12.5 grams of coffee, XBold Cups ™ pack up to 15 grams of coffee and XLARGE CUPS™ provide up to 18 grams of coffee. Flavor Grooves swirl the coffee grinds to release bold aromas and flavors. The Refill Jumbo Cup™ packs up to 40 grams of your favorite coffee grounds—ideal for filling a carafe or large travel mug. The Touch® T526S brewer, which comes with a reusable Refill Jumbo Cup™ and 26-ounce carafe, is currently available online and has an MSRP of $249.99. For additional information about Touch's brewers, accessories and coffee, please visit www.TouchBeverages.com. Purchase Touch Brewer T526S Brewing System For Single Cup Coffee on Amazon for $249.99 & FREE Shipping. I have never owned a single serve coffee maker before, but I have used one at work and at various hotels that I have stayed at. I have had the same complaint, the coffee is not hot and I am just not a fan of how the coffee tasted. 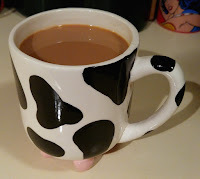 I wanted something that would mimic my regular drip coffee pot but on a smaller cup scale. 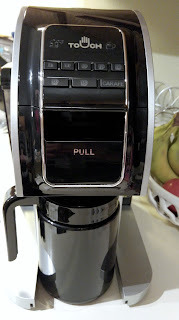 I have finally found that with the Touch brewer! The coffee is piping hot and the cups of coffee are delicious. It is super easy to use, just touch the on button, cup size and let it go and in less than 30 seconds you will have the perfect cup of coffee! I love being able to use my own ground coffee with the included reusable Jumbo Cup. I get the same great taste with this brewer and I can make as little as one cup to a small carafe to fill my travel mug! You are not restricted to only using the manufacturer's coffee like some machines. You have total freedom to purchase and brew any coffee you want. Many brands work fine with this unit or if you are like me, you just brew your own with the insert. They have addressed the major complaints of existing machines out there on the market (weak coffee, the ability to brew only a small cup at a time, and flawed coffee capsule designs and water heating systems) in order to make a great, coffee-house quality cup of coffee quickly and conveniently at home. You can't go wrong with this machine, it is perfect for any lifestyle...the occasional one cup person, the person who likes multiple cups, the flavor adventurer, etc. You can make multiple sizes and try different flavor cups to find the perfect cup for you! So this Valentine's Day, show the one you love just how much you know them with a Touch Brewer T526S Brewing System. Touch Coffee & Beverages (Touch) is an innovation-driven company with over a decade of experience in developing, manufacturing and marketing electronics and kitchen appliances. Touch is revolutionizing the single-serve coffee platform for both home and office with re-engineered cups and advanced brewing technology for producing coffee shop-quality coffee. For more information, please visit www.TouchBeverages.com. *Disclaimer; Touch Coffee & Beverages, LLC is NOT affiliated with Keurig, Inc. or Green Mountain Coffee Roasters. Keurig® and K-Cup® are registered trademarks of Keurig, Inc.